CPM-E is excited to welcome you to our CASIO graphing calculator sales division! 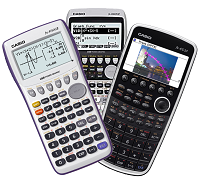 We believe the products CASIO offers are more user friendly for both students & educators… not to mention a fraction of the cost! Whether you are here as a student, parent, or educator, we have this website set up to answer all your questions and provide you with lots free resources. If you think something should be here and you can't find it, let us know at casio@cpm-e.com and we would be happy to help! The links posted above will take you around to all the info you need. Our secure online store allows you to buy from the comfort of your home, and have your calculator delivered directly to your school!